We are so bold as to offer a 100% Customer Satisfaction guarantee because we aren’t happy with anything less. It’s an honest statement that any cleaning service will have to be repeated, eventually. We are a full-service Annandale VA pressure washing company that offers a variety of services. If you don’t see a particular service that you need, please don’t hesitate to ask us. If it can be power washed, then we can probably do it! Exterior Soft Wash – the best way to effectively wash materials like vinyl siding and asphalt shingles without the risk of damage. Window Cleaning – we offer this as a standalone service, or in conjunction with our exterior soft washing. When we are called out to pressure wash a home, it’s often easiest for the home owner to also have us clean the windows too. Gutter Cleaning – having your gutters cleaned regularly can prevent leakage or overflowing water from dripping or running down the outside of your home. This leakage or overflow could increase the chances of mold or mildew growth. Clogged gutters have also been known cause leaky roofs. Deck Restore – If you have a weathered or ‘old-looking’ deck, then this service is for you. Having your deck properly power washed or soft wash with the use of a detergent can make your deck look like new again. Without having to pay for an entirely new deck. Deck Painting and Staining – If you call Annandale Atomic Power Washing to help you with your deck restore, please ask us about our deck painting and staining service. It is strongly recommended, and we dare say necessary, to paint or stain your deck of cleaning it. This will help seal the wood, leaving the nicely restored deck looking clean for a much longer time. Concrete Cleaning – Arguably among the most durable materials that can be found on the exterior of a property, concrete can definitely get dirty. We specialize is removing oil stains from driveways. It is our hope that we are able to pass down our family company to our children some day. A power washing company that has a built up a great reputation through the years. 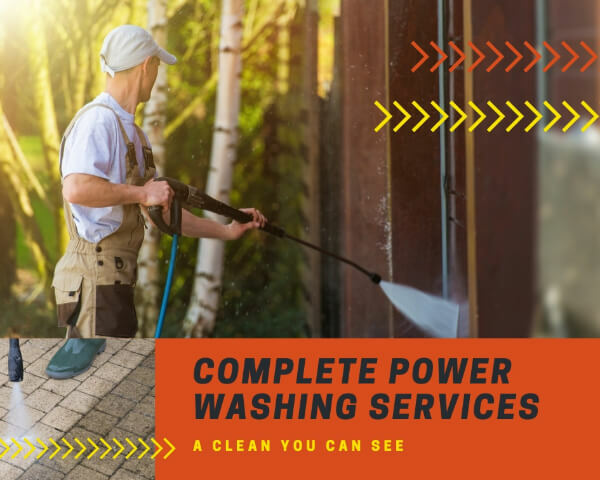 Our hope is that you will choose Annandale Atomic Power Washing as your go-to pressure washing company each time you need a portion of your property’s exterior cleaned. In order for that to happen, we know we need to make an impression on you that you’ll never forget. Why do you remove stains from your favorite shirt? Does the shirt’s value decrease if it’s stained or dirty? Is it less appealing to look at it? Does a stain make the shirt less impressive to others? Maybe you don’t care what others think about your favorite shirt, but you know that without regularly washing it, it probably won’t last as long. These same principles can be applied to the outside of your property. You’ve invested much more in your property than you have your favorite shirt. Whether it’s your property’s roof, sidewalk, driveway, fence, or even the literal exterior materials of the property such as vinyl siding or brick, it gets dirty. These places around your building or home actually take a beating from the elements, they just tend to hide it better than your favorite shirt. We mentioned your favorite shirt earlier. If it really is your favorite shirt then you probably would not ever want to try to sell it. But for the sake of the point, let’s assume you want to try. Would you even consider selling it if it had a giant stain on it? Umm… we didn’t think so. So why do people try to sell their properties when the exterior is a mess? Isn’t it the same principle? Things that look dirty don’t sell. It has been noted by many real estate agents that properties that have been recently cleaned up, sell faster. The interior is important, yes. But the exterior is just as important, if not more so. After all, it is the first ‘thing’ potential buyers will see when they pull up. If you were ready to purchase a new property, would it be easier or harder for you to spend your money on something clean and pristine? Mold, mildew, algae, and even moss can pose a real threat to most surfaces. Having a professional pressure washing company out regularly can help keep these areas maintained. This will allow your investment to last even longer. How Dangerous Is Mold On Your Vinyl Siding? Vinyl siding is a so widely used today because it is known for being durable and affordable. One downfall that comes with having this material on the exterior is it’s tendency to grow mold and mildew. Mold on your vinyl siding is usually the result of accumulated dirt, moisture and a lack of sunlight. In worse case scenarios it can damage your home’s structure, weaken the integrity of the siding, and . One way to effectively prevent the growth of mold, mildew or algae on your siding is to have a power washing professional keep it for you. Do I Need a Professional Power Washer? Do you know what pressure and process to use? How about the equipment? Do you have the time to figure all of that out? If you answered no to any of those questions, please call us. It is very important that the right amount of pressure be used when cleaning vinyl siding. As durable as the material is, if too high of a PSI (Pounds per Square Inch) is used then you could cause damage to the siding. If the pressure washer is used at an incorrect angle it could drive water behind the siding. Causing you way more problems. We all get excited when the time of year rolls around when we get to start living outside again. Spring and summer are most peoples favorite time of year. But after a long winter, spring cleaning is usually what kicks off the warmer months. Pool parties, BBQs, and picnics are often the best part of the season and we can help you get your outdoor area looking clean, fresh, and new in no time. Ready for summer? Contact us to get your outdoor area ready too! The people were very friendly that we talked to and they showed up when they said they would. Our home looks fresh and clean thanks to you guys! The power washing guys that showed up arrived on time and they were well uniformed. They did an excellent job washing our patio. I will be calling again, for my roof to be cleaned. Fast estimates, quick scheduling, and incredible results! I don't think i could have had a better experience with Annandale atomic power washing. Annandale Atomic Power Washing provides great power washing services. We recently had our roof and siding cleaned by them, and it looks brand new!! Roof Cleaning only took about 90 minutes and made my roof look nearly new! 5 stars! Fast scheduling, Arrived on time, and performed excellent work! We are very satisfied with the power washing service performed and the prices were affordable!